Roman Holiday Christmas 5.5" Joy Marquee Swirldome Glitterdome Snowglobe. This festive quality snowglobe measures 5.5 inches tall and has a plastic base with a glass globe. The snowglobe features a marquee light up red "Joy" sign with falling silver glitter snow once the snowglobe has been shaken up. The base of the snowglobe is covered in white glitter that looks like beautiful sparkling snow. Perfect accent to your holiday decor! Also makes a great gift! 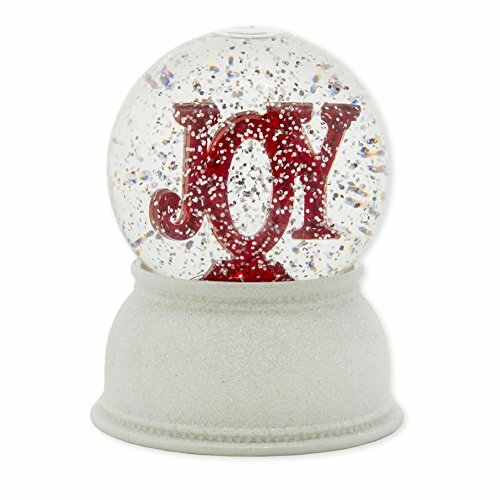 The snowglobe features a marquee light up red "Joy" sign with falling silver glitter snow once the snowglobe has been shaken up.